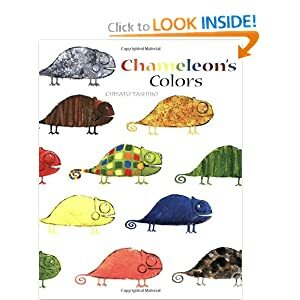 Our book we read today is Chameleon's Colors by Chisato Tashiro. Today Aubrey made her own colorful chameleon. I printed out a chameleon here. To begin, I put out four bowls and put some shaving cream in each one. I had Aubrey squirt food coloring onto each pile of shaving cream. Once each bowl had food coloring, I had her mix each bowl with a toothpick. She then took a spoon and plopped the mixtures all over her chameleon. Once the chameleon was filled with shaving cream, I had her scrape the mixture off with a spatula. Aubrey LOVED doing this activity! I thought it was really, really messy!! **The food coloring can stain so be careful with clothes and your furniture.